The Apache HttpClient library simplifies handling HTTP requests. To use this library you have to download the binaries with dependencies from their website. For JSON you can use JSONObject to create string representation of JSON. nameValuePairs.add(new BasicNameValuePair("name", "value")); //you can as many name value pair as you want in the list. There are also other media formats in which you can get the response like PLAIN or HTML. Here myPojo is an instance of custom POJO class. Gateway interaction is described by XEP-0100. The query xmlns (namespace) used for this is same as IN-Band registration, that is “jabber:iq:register”. Smack API provides an easy way handle gateway interaction with the server. It has predefined classes for the required namespace and operations which one can easily use and do the thing. In this article I will explain how one can register, edit, unregister and retrieve gateway information using Smack library. I have listed both XML and code using Smack API for the purpose. I have used Openfire server with Kraken plugin in it for gateway related operations described in this article. By this you will know that which fields are required for gateway registration. Here in this example 2 fields are require, one is username and another is password. To retrieve registered gateway information one has to send an IQ GET packet with “jabber:iq:register” query to the gateway id (i.e. 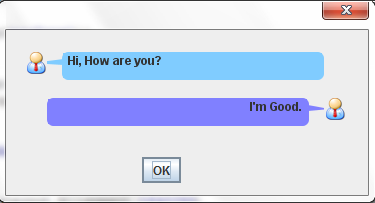 gtalk.myHost). This is similar what we did to get gateway information. In short when you can query gateway for information it will return the information with currently registered information, if any and if there there are no registered information then response is just about the required field names to register. // map contains information about registration. To edit registered information one has to first fetch information as shown in above section and then follow the same code for registering gateway. In simple words do point 3 & 4 form this article in reverse order. This is very similar to the register gateway xml so difference in code is very small. Instead of adding username and password as attributes in Map you just add a “remove” attribute and everything else is same. Everything else in the code is same. Response is also similar to the register gateway response. 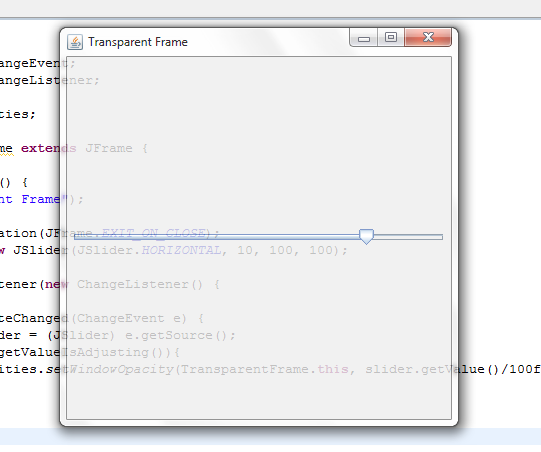 In Make JFrame transparent I had shown a way to making frame’s transparent using AWTUtilities class. But using that class results in access restriction compile time error, resolution in Eclipse is also shown in that post. Now here is the version using java natives. I have used Java Native Access (JNA) library to call native functions to get the things done. What is Java Native Access (JNA)? JNA provides Java programs easy access to native shared libraries (DLLs on Windows) without writing anything but Java code—no JNI or native code is required.JNA allows you to call directly into native functions using natural Java method invocation. Here WindowUtils class is provided in JNA jar (platform.jar). The method setWindowAlpha of WindowUtils class is used to make a window transparent. First argument of this method is your frame/window and second argument is alpha value. This class also has a method called setWindowTransparent, which can also be used to make window transparent . To run above code on Windows, you will need to set “sun.java2d.noddraw” system property before calling the WindowUtils function. If you test it on other machines or have code for other machines using JNA for the same functionality then feel free to share it as comment to this post. Architexa is a really useful tool for generating UML diagrams for Java projects in Eclipse. Most UML tools out there give you functionality of generating classes from the diagram you have created. But in Architexa you have a reverse functionality; it generates diagrams from existing code. It helps a team to understand and document collaboratively a large Java code base. Starting from today, Architexa is available for free for individuals to use, and this post talks about my experience using it – how I used it?, which features I used?, and what I think of it? Why should one use Architexa? Working with a new project or difficulty in introducing an existing product to a new team member. Finding it hard to understand the architecture of your code. Exploring unfamiliar code to determine its dependencies, relationships, interactions, and behavior within a codebase. Trouble finding a starting point in a large codebase. Wasting time deciphering complex code or documenting about code. If your answer to any of the above questions is YES then you must go for Architexa. It will handle all these difficulties for you. Architexa helps you create UML diagrams directly from the code in just a single click. So making UML diagrams is way easier than before. It can create layered-diagrams, class, and sequence diagrams. These diagrams become the base for effective discussions and act as useful documentation for the project. Architexa allows you to add and edit Java Doc from code and other notes right next to the diagram. As do many other Java developers out there I also use Eclipse as an IDE for Java development and face some of the issues listed above in development due to lack of documentation about the project. I was already using an Eclipse tool/plugin for UML diagrams in Eclipse, but that tool was only very helpful if you are the one who starts the project. If you have been given a project that is already developed and does not have enough documentation to understand its flow and code then that tool doesn’t help me much. About few days ago I got an email about Architexa, a tool for generating UML diagrams for Java projects in Eclipse. At first it looked like a normal tool of generating UML diagrams and I thought why download and use it as I was already using a tool to do same thing? But then I came to know about its functionality of directly generating UML diagrams from the existing code and this feature forced me to try Architexa once. And as I was expecting this is really a great and helpful tool for understanding the top level architecture of a large project. And as an advantage it provides functionalities of sharing diagrams or exporting diagrams as pictures. I tried Architexa with one of our currently on-going projects and I would like to share my experience about how I used this tool and what features I liked most. I have written how I installed it and used it. I have listed what features I liked and used and would like to suggest you use those features. I have also written suggestions from my side that I would like to see in the product. Download and installation of Architexa is very easy. One can start this procedure by registering on their site here: http://www.architexa.com/start. This registration is required as when you complete the installation it asks for this registered username and password. After this registration steps complete it will take you to the page where you find information on how to install Architexa on your Eclipse, which is also easy understandable and easy to follow. You also have to follow an email verification process which I guess is a very known and common practice to protect from spam and everybody is familiar with it. We have also installed extended features and the in-house group server to see how they all works together. Before generating diagrams you first have to configure Architexa indexing. You can configure it after successful installation and account validation or later in Preferences. After this configuration you are ready to generate diagrams. You will see a Cheat Sheets view of Architexa when you install it, where you find and explanation of steps to get started with the different capabilities of Architexa. Size of the module is drawn based on code inside it and they are also placed in layered style such that higher layered modules are dependent on lower layered modules. When you hover on any class or package it shows it’s dependencies by arrows to other class and/or packages. Also those packages are highlighted to get proper focus on it. It helps us to decide which modules will get affected if do change in a module. Double clicking on packages will show the classes and packages inside it. You can easily add new packages, classes, general connections, actor, database and/or comments directly from this diagram. Generating class and sequence diagrams is also easy, right click on some class then click on Open in diagram->Class diagram or Open in diagram->Sequence diagram. When you do this it draws a diagram with only one selected class, no any other classes to make it messy. Now you can add things you need by dragging and dropping classes or by exploring class members/methods and their dependencies. Also it uses icons for classes, members and methods that Eclipse uses, so it becomes easy to understand it. A sequence diagram is a good representation of call hierarchy of methods or members of a class. By this you can easily see which methods/members are called and used by which other classes. To demonstrate the possible flow of control that a system could take depending on various conditions or tests, Architexa displays loops, iterations, and conditional statements in sequence diagrams. You can easily go to the code of particular class or method by just double clicking on it. You can add new methods and/or members to a class. You can also add method call, inheritance, method override, actor, database, comments in these diagrams. In sequence you can see differences in a file if 2 or more members of a team are working on same file. It shows difference in the diagram which is in my opinion a very cool feature. Sequence diagrams are also integrated with the debugger. 3rd option is for saving a diagram on their server. When you click on it, you will see Upload to server view. Here you can give it a name and choose a group to share this diagram with. The other way to share is by email. I have not tried this functionality yet and so am not able to write much about it. In layered-diagram, if I drag and drop packages then sometimes it results in duplicate packages in the same group. In layered-diagram, sometimes an empty group of packages gets hidden and sometimes it stays visible. Not sure if it’s intended but it doesn’t look consistent to me so would like to see a change in this. Diagrams also include method calls to Java’s default classes like Map or String. What I think is generally people don’t want to know about these classes and calls to methods of these classes as they can be considered as a part of the implementation and not documentation. It’s a part of how one has done the task. Everything else in this diagram is cool. Fonts used for class names in layered diagram are quite bigger relative to package names; it will be good if it can become smaller. If you close Eclipse without saving the diagrams, it doesn’t notify or alerts you about first saving diagrams and then close Eclipse. It should alert if one is closing Eclipse without saving diagrams. Architexa is a good tool for UML diagrams in Eclipse for Java development. It is very easy and simple to use. Once a class is in a diagram, it is always kept up to date so no need to refresh diagrams every time you change something. And the graphs are also very readable. If you have a large team in which members keep getting changed or you are the one who is responsible for understanding already written large codes then this is the must-use tool for you. Currently Architexa is only available for Java. Though they also have a prototype for C/C++. If you have used it for a new project from the beginning then it will become very easy to document your project, share the diagrams, code change reviews, and much more. I have seen many peoples struggling from file transfer in asmack – Android build environment and patches for smack. I tried same library with Openfire server after some debugging got success in it. So I will like to share my problem and solution for it. I found that the problem is in Byte Stream host, it tries to connect to wrong host for initiating file transfer using byte streams. If you have not configured the file transfer proxy properly then it will choose 127.0.0.1 or localhost or any internally configured host/ip as a bytestream host, which in android is not considered as proper ip for communicating. But wait then why it is working properly with desktop client with same server. The reason is desktop clients can easily identify this ips and can use it to open socket for file transfer. myHost The hostname of machine on which Openfire is running. Here you can know that whether bytestream file transfer is supported on the client other side or not. If you see a xml like above in response then it’s supported on the other side and you can go further. Here you will receive various items for different items supported by server like , file transfer proxy, search service, conference service… The item we should look for is ` Socks 5 Bytestreams Proxy `. Here the host in the <streamhost> is the key for the file transfer. You have to make sure that this host is accessible from your android phone. It should not be like localhost, 127.0.0.1 or any company’s internal configured server which is not accessible outside of the company. It must be a publicly accessible ip address or host. The asmack library I used was asmack-jse-buddycloud.jar. This article will explain you “how to draw chat bubble in java swing application?” Chat bubble is same as call-out or thought bubble. Today most of the chat application is showing conversion in this format, so this article will help you to do the same in desktop application made in java swing.